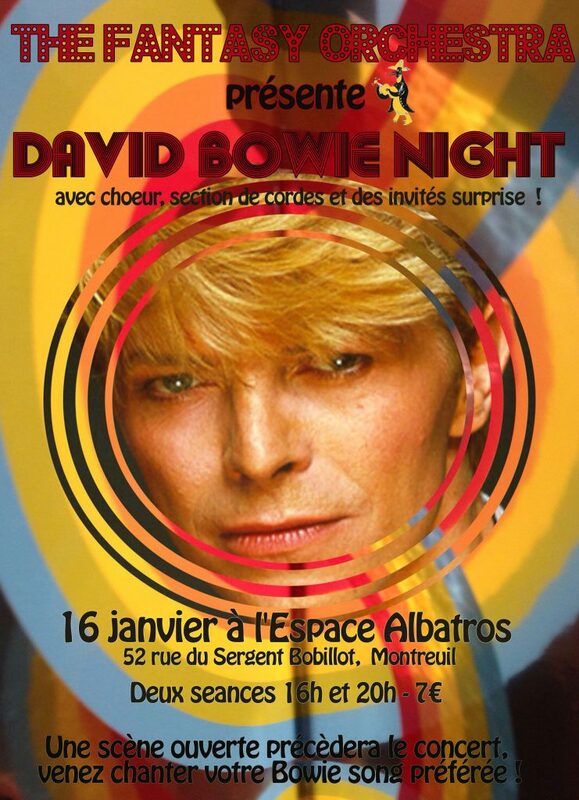 Soiree David Bowie – 16 janvier 2016 à l’Espace Albatros, 52 rue du Sergent Bobillot, Montreuil. 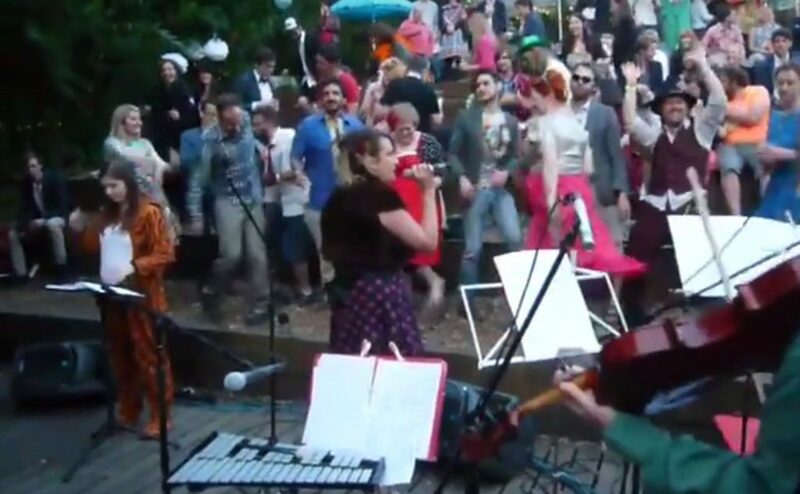 Une scène ouverte précèdera le concert, venez chanter votre Bowie song préférée ! 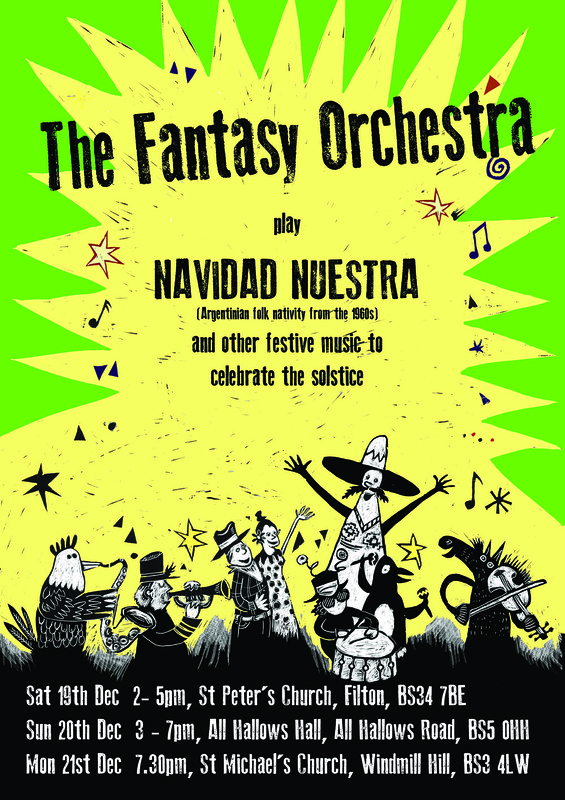 Autumn’s been a busy season for the Fantasy Orchestra. 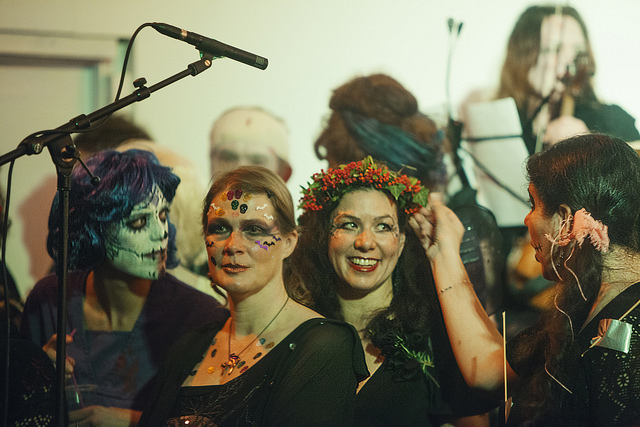 First there was our set at the Priston Festival near Bath, then for Halloween we took over the Kuumba Centre in St Paul’s, Bristol for a night of macabre revels. 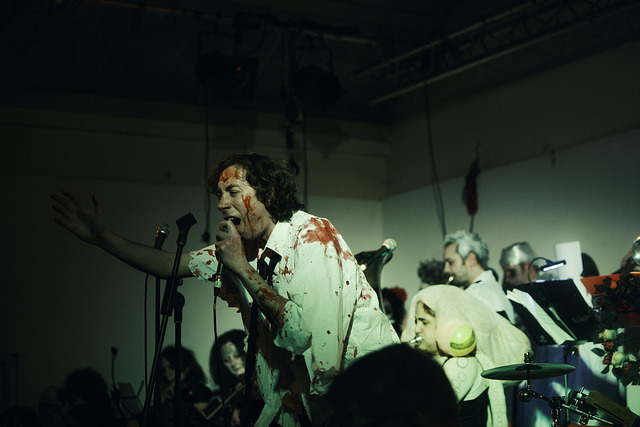 The mostly new repertoire included songs by Dr John and the Specials, and Jeffrey Lewis’ If You Shoot the Head You Kill the Ghoul, which is fast becoming an orchestra favourite. 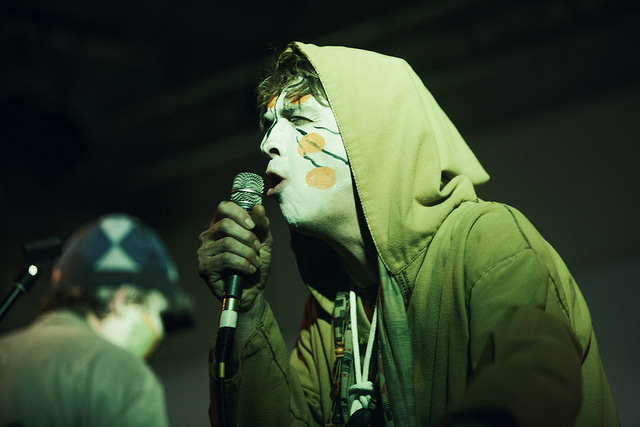 Lots more ghastly photos on our Flickr pages. 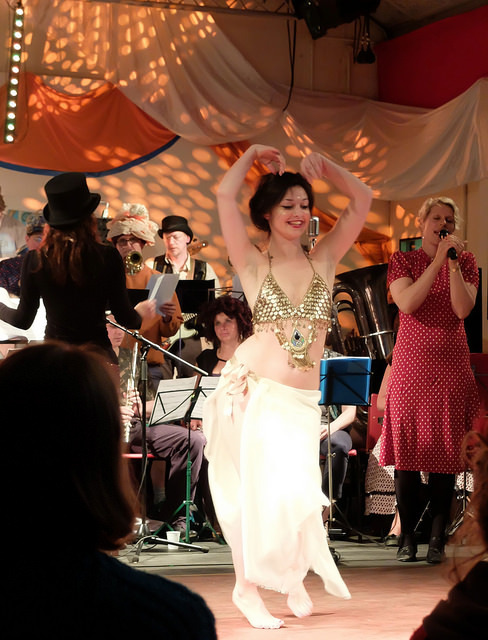 Coming up on 5 December at the Trinity Centre: our second Bowie Night! 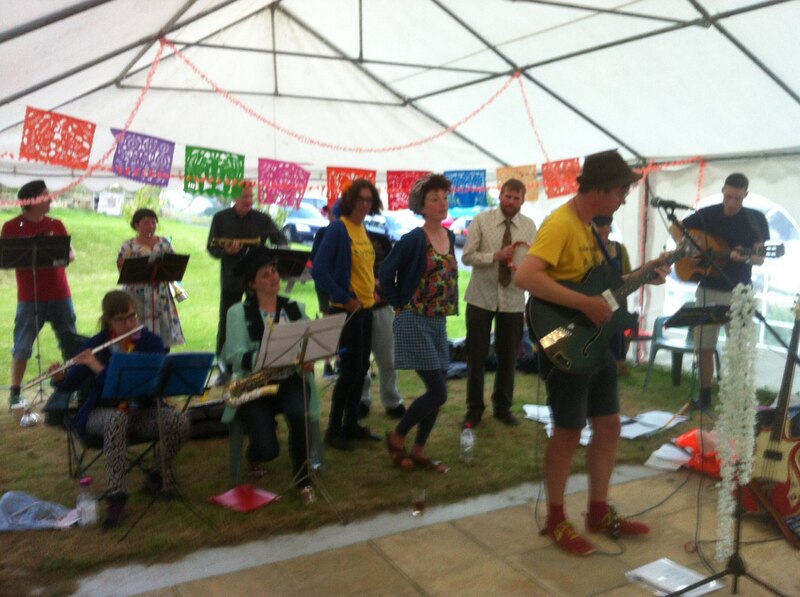 Coming up: A set at the Priston Festival, 19 September! 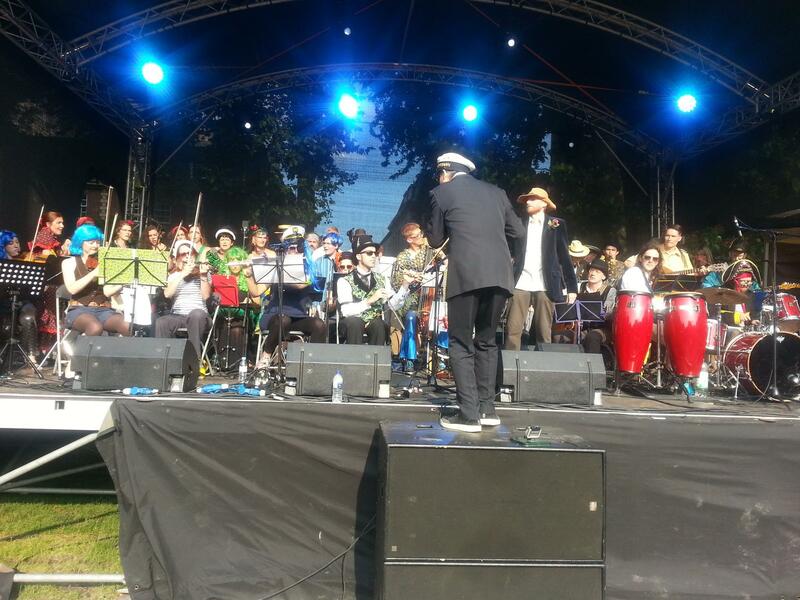 The Fantasy Orchestra, over 40-strong, opened the 2015 Bristol Harbour Festival in Queen Square on Friday 17 July. 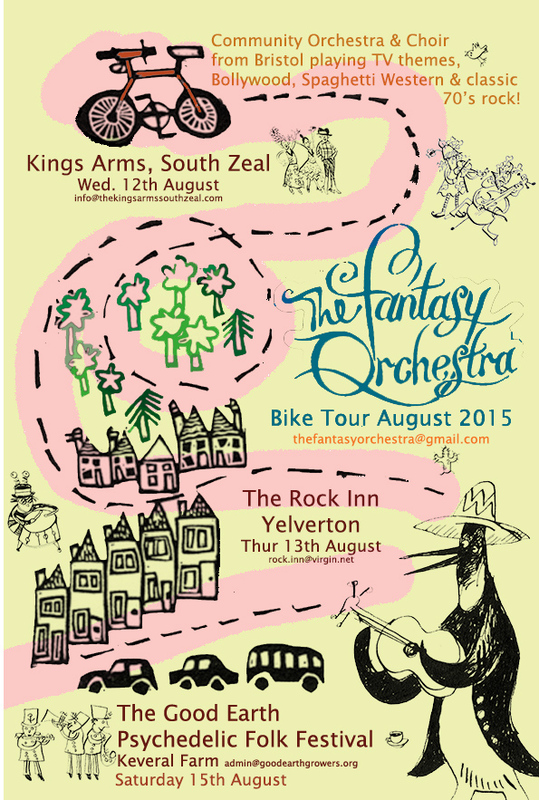 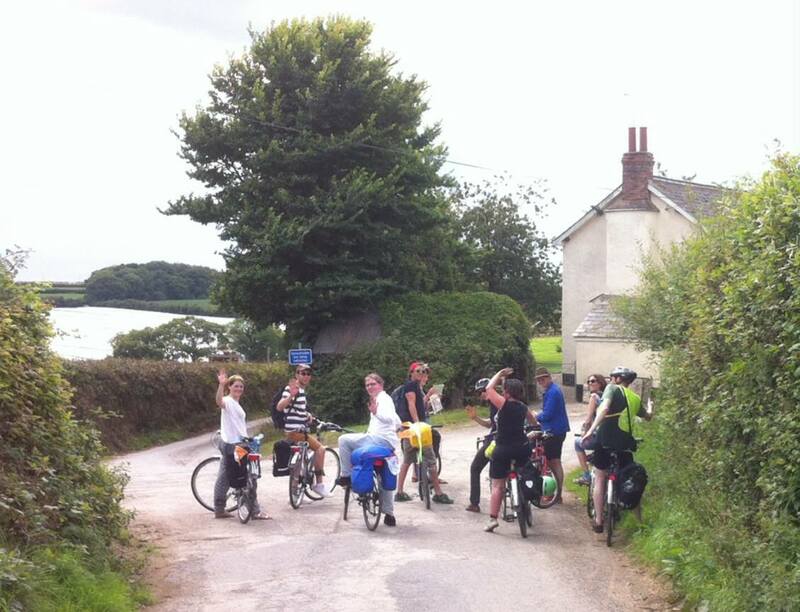 The Fantasy Orchestra’s 2015 Bike Tour is coming up! 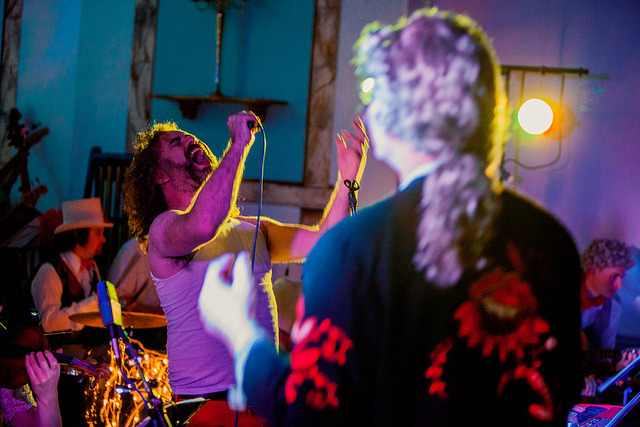 We’re heading for the South West, playing a couple of shows in Devon and finishing up at Keveral Farm near Looe in Cornwall for the Good Earth Psychedelic Folk Festival on Saturday 15 August. 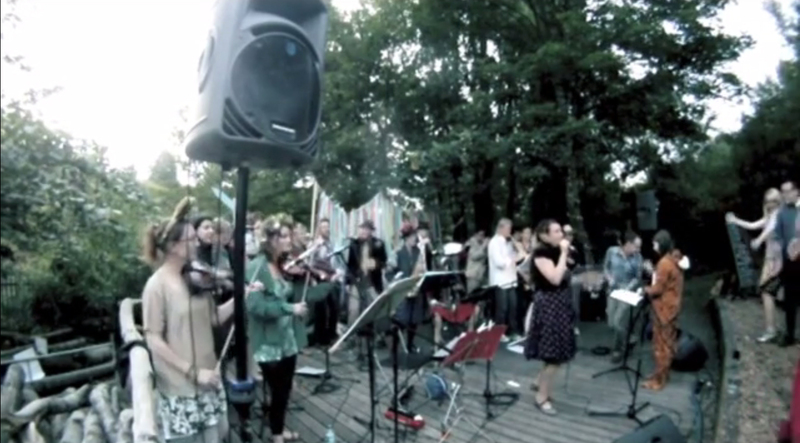 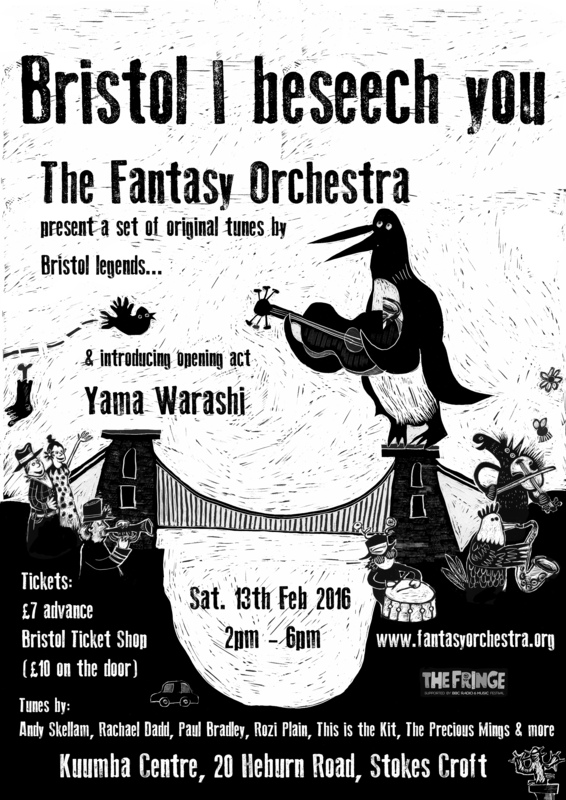 A scaled-down Fantasy Orchestra played at this year’s Music on the Hill, organised by the Friends of Troopers Hill in St George, Bristol. 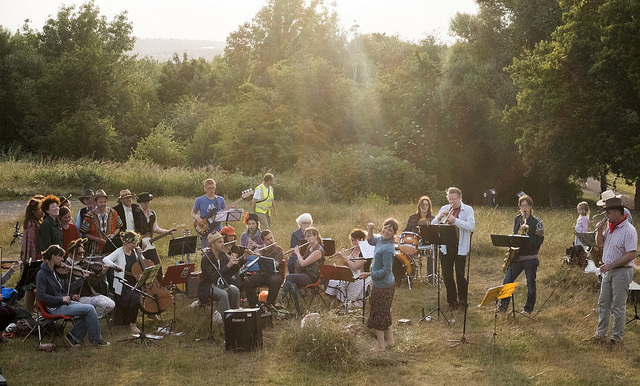 A sizable audience of picnickers, strollers, kids, dogs, and other species native to the hill’s protected grassland listened to the FO’s takes on Hendrix, the Beatles, Morricone, Bowie, and Bollywood’s RD Burman. 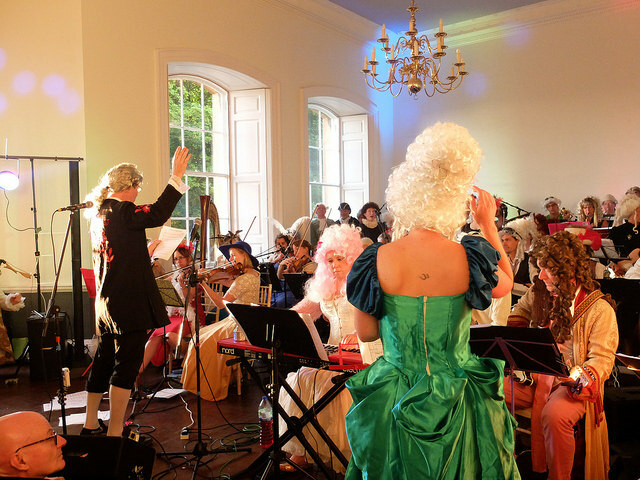 The Fantasy Orchestra took up residence in the Georgian splendour of Kings Weston House for an evening of music and wigs, with DJ sets from John Stapleton and Pencilface. 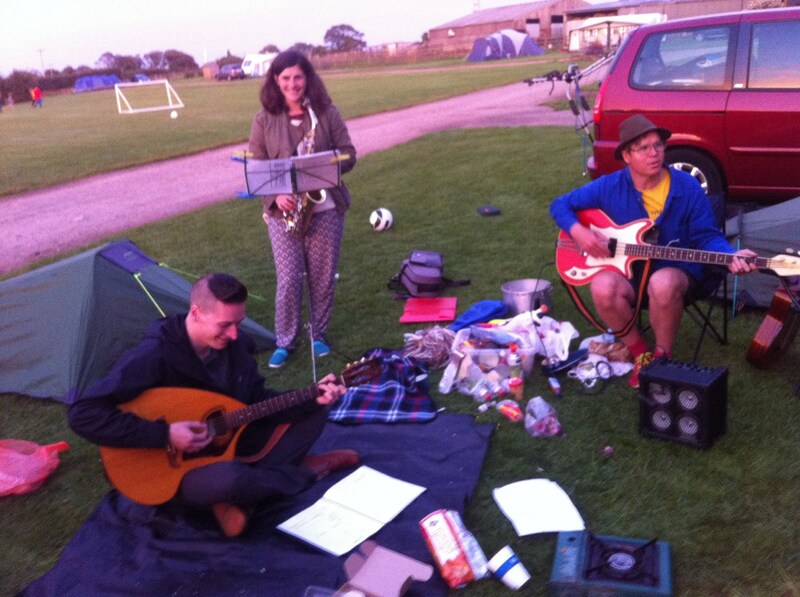 More images in the Flickr collection. 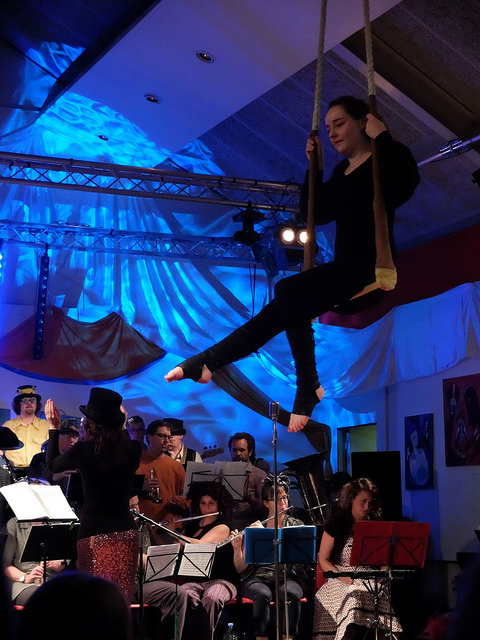 The Orchestra took part in Kuumba Live at the Kuumba Centre in St Paul’s, Bristol — one of their regular rehearsal spaces — playing a 90-minute show accompanying jugglers, a trapeze artist, breakdancers, a bellydancer, and other performers. Many more photos in the event’s Flickr album.